"Significant impact" means shares have risen, will rise and will keep rising, giving the market indexes a feel-good pop lasting, with any luck, well into the new year. 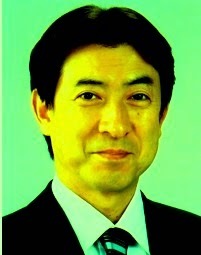 Minister Shiozaki himself has shareholdings -- and not in a stock fund or a blind trust, either. More than any other member of the Cabinet. Shiozaki says he is a completely passive investor -- which is good, because trading while serving in the Cabinet is verboten. Furthermore he says he only inherited his shareholdings from his maternal grandfather and generally has little interest (kanshin) in stocks. Still, would it not be interesting, just out of the purest of intellectual motives, to calculate exactly how much today's announcement can be construed as having profited Minister Shiozaki -- i.e., how much more money he has at the end the day than he did at the beginning? A very happy camper he must be.